← Kentucky Goes Down HARD!!! 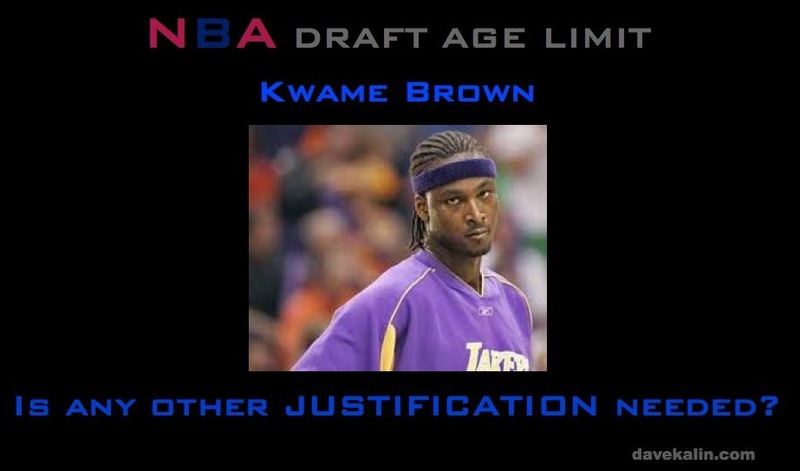 Kwame Brown 2001 NBA Draft #1 Selection. Does the NBA really need further justification for insisting on an age limit for it’s prospective employees? Every other profession has standards which expectant employees must meet in order to apply for employment. Attorneys, Doctors, Mechanics, Scientists, Engineers. All who apply for these professions must meet certain standards of professionalism and development. This keeps out those who are incompetent to the profession. Why is Sports exempt from setting standards for entry into it’s ranks of professionals? How does the mere act of finishing high school and attaining the age of 18 make one qualified to enter the NBA Draft? If I were an NBA GM, player, owner, coach or Executive, I would want a certain standard to be met before a prospective employee could apply for entry into the National Basketball Association. The NBA is not for streetballers, AAU players or mid-level college players. How can the NBA be certain that prospective employee is able to adapt to playing in the NBA? One test is the NCAA ranks. It’s really the only test that matters. If a kid isn’t talented or mature enough to play at a high level in the NCAA, they don’t have a right or a prayer of making it in the NBA. Some athletes will take longer to develop than others. Why should the NBA be compelled to hire athletes who are not ready for the NBA? When these young men are drafted, the CBA mandates certain salaries. Each year, half of the draft class (or more) flunk out of the NBA. They are either relegated to the NBDL or to make their way to Europe, Canada or Asia. Why should the NBA be compelled to take a chance on these young men? Would Nerlens Noel or Shabazz Mohammad been a sure thing in the NBA? Was Kwame Brown? Were the hundreds of other kids who have failed sure things. No! They were not. Injury is part of the risks one takes when one is an athlete. It’s part of the game. It’s part of the profession. No wage or living is guaranteed to any of us. No athlete has a “right” to play in the NBA (or the NFL for that matter). It’s lunacy to insist that the NBA or NFL hire employees who are under qualified for the job.